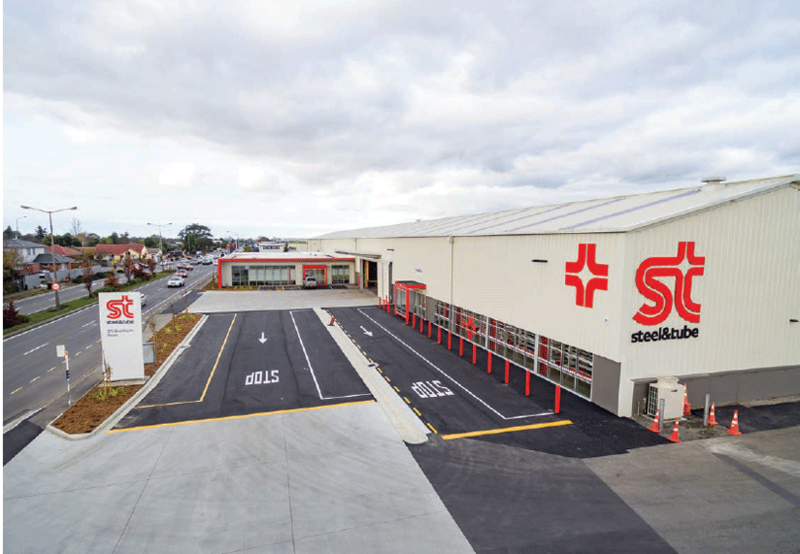 The completion of Steel & Tube’s major refurbishment of its Christchurch Distribution Centre at 375 Blenheim Road, marks another key milestone in the company’s multi-million dollar reinvestment programme. The project, which consolidates a number of facilities into one, is part of a major renewal programme Steel & Tube is undertaking across the country, co-locating businesses and increasing scale, improving safety and quality standards at sites and making them more accessible to customers. It follows on from several other notable infrastructure milestones including the opening of Steel & Tube’s Dunedin facility and the purpose built processing facility for roofing, coil and purlin operations in Hornby, Christchurch, during 2017. Robyn Cameron, Steel & Tube’s Project Manager for New Buildings, says the Blenheim Road development, along with Steel & Tube’s other builds around the country, is all about becoming more involved with the customers throughout the customer life cycle. “This is part of a major renewal programme we’ve undertaken in the Canterbury region,” explains Robyn. “What we’ve done here is consolidate two facilities onto a single site that will be the Distribution Centre for the South Island with sixty plus staff on site. Steel & Tube Distribution has been well established in Christchurch since the Blenheim Road building was first opened in 1962, with additional warehousing being added as the business grew. Over the last few years it became apparent that the business had outgrown the existing building with some product being stored externally, and an additional site set up in Christchurch East for some operations. With Steel & Tube embarking on a program of work throughout New Zealand it was an ideal opportunity to extend the existing building. Peter Donohue, Steel & Tube’s South Island Regional Manager wanted to stay in Blenheim Rd and refurbish the building to achieve efficiencies with health & safety, new offices, better parking, drive through operations, a new racking system to enable better picking processes, and a Tradeshop that incorporated Fortress and Hurricane brands. Working closely with key stakeholders, Robyn determined critical requirements taking into account lessons learned from the other builds and gaining Board approval to embark on the refurbishment project. Architects and designers worked with the company to accommodate innovative ideas and improved safety practices for customers and staff, supporting every step of the process, from the time product is delivered till it leaves the building. 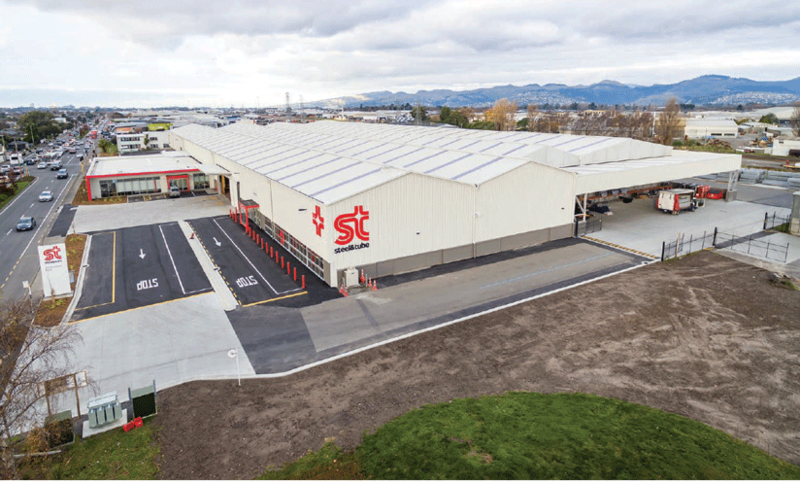 Steel & Tube’s major refurbishment of its Christchurch Distribution Centre follows on from several other notable infrastructure milestones including the opening of Steel & Tube’s Dunedin facility and the purpose built processing facility for roofing, coil and purlin operations in Hornby, Christchurch, during 2017. Christchurch firm, Engenium Consulting Engineers, provided structural and architectural design for the refurbishment while Southbase Construction along with the subcontractors undertook the build. Nationwide quantity surveying group Rawlinsons were engaged to undertake all QS work. Robyn says the new space is larger than the previous site and the effort required to bring the building from concept to completion was significant, with planning and preparation beginning over two years ago. However, the end result is a building that is now fit for purpose and fit for the future, she says. Steel & Tube’s products have been used in numerous iconic buildings and developments throughout the country, providing steel, building services, fastening products plus essential items for the building industry. Through this time, Canterbury has played a vital role in Steel & Tube’s nationwide network, providing a point of access and a distribution hub for the company’s South Island customers. Steel & Tube has been involved in many major Christchurch building projects from the Justice Precinct to the Christchurch Hospital Acute Services building; the Regional Science and Innovation Centre at the University of Canterbury and redevelopment of Burwood hospital. Servicing Canterbury’s customers for over 60 years, Steel & Tube has been involved in many major infrastructure projects from the Justice Precinct on Tuam Street to the Christchurch Hospital Acute Services building; the Regional Science and Innovation Centre at the University of Canterbury and redevelopment of Burwood hospital. “Steel & Tube’s involvement can be seen almost everywhere you look in Christchurch,” says Robyn.